intervention by conducting Assessment on use of oxyfluorfen and quizalofop ethyl at 12 DAT for control of grassy as well as broad leaf weeds. The results have been found to be very encouraging and the yield due to control of weeds in kharif onion has increased to 280.5 q/ha registering an increase of 16 per cent over farmers practice. The same assessment was observed to be successful and was later demonstrated among farmers in Wakadi, Rajuri and Mamdapur village. Taking the cue from KVK’s assessment and demonstration the MPKV has also conducted the trial on use of oxyfluorfen and quizalofop ethyl at 25 DAT for increasing the onion bulb yield of farmers. The KVK Babhaleshwar has also taken effort to disseminate the technology through use of mass media like KVK Pravara Community radio and AIR Ahmednagar where the use of weedicide has been greatly disseminated further in Ahmednagar district. Later the farmers gave a feedback that the second weeding generally which is required to be conducted at 75 DAT as per recommendation was not being followed due to high labour cost during second weeding stage. Here the KVK scientist inetervened and provided an innovative solution of broadcasting of sand mix 0.75 a.i. kg/ha pendimethalin at 35 to 40 DAT after completion of first hand weeding to control the emergence of weeds and reduce the labour cost on second weeding and facilitate bulb size enlargement and yield. The results have been found to be successful with demonstration plots registering an average yield of 201.1 q/ha and increase of 16.3 per cent over farmers practice. With overwhelming success of this sand mix application of pendimethalin the farmers have expressed their readiness to use this innovative for not only kharif onion but also other crops like sugarcane, brinjal, chilli and other exotic vegetables in Khandala village. 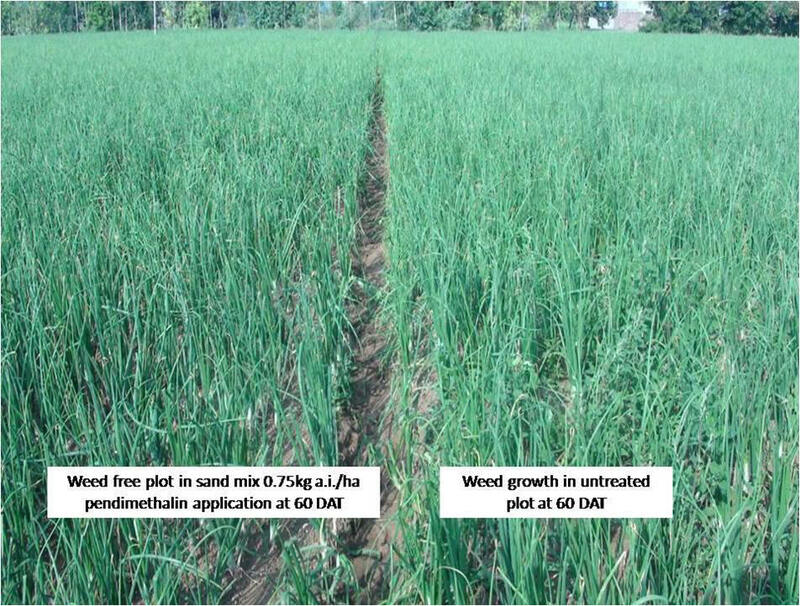 The KVK has demonstrated successfully the use of oxyfluorfen and quizalofop ethyl for control of grassy weeds and broad leaf weeds during kharif while the problem of second weeding labour cost was taken care of by broadcasting sand mix pendimethalin reducing the weed control cost by Rs 3417 per ha. There is a large scale adoption of use of this treatment following KVK’ intervention. Similarly the use of sand mix application has also been accepted by the farmers and are ready the accept the treatment during the next season.